Whether you’re into road cycling or mountain biking, Maine is a beautiful place to explore on two wheels. In a state that loves to bike, you’ll find a wide selection of high-quality bike shops expertly managed to meet all of your biking needs. From Kittery to Fort Kent, you’ll find everything you’re looking for at the 10 best bike shop in Maine. Allspeed Cyclery & Snow is one of Portland’s premier bike shop that offers bike rentals, demos, consignment, and sales. With the fastest turnaround in town, Allspeed is the place to bring your bike for its tune ups and repairs. With professional and knowledgeable staff, they will help you choose the perfect bike for your needs. Don’t forget to try one of their legendary mountain bike rides during the week. Rainbow Bicycle has been Central Mane’s premier bike shop since 1982. As a full-service bike shop, Rainbow Bicycle offers bike fitting, bike tuning and repairs, and bike sales. The shop has a great selection of Cannondale, Trek, Felt, and Fuji road and mountain bikes. Nestled in Norway, Green Machine Bike Shop is the local small town bike shop, but there is nothing small about this shop. From bike components to frames to all the goodies you need, you’ll find everything you need at the Green Machine Bike Shop. The shop sells Scott, Santa Cruz, Felt, and more. Join one of their Wednesday night rides. Berger’s Bike Shop is one of Maine’s oldest bike shops dating back to the 1970s. Housed in old General Motors garage, is a full-service bike shop with an unofficial coffee shop out the date. Come for a coffee and leave with a new bicycle! The shop currently stocks Trek and Electra bikes. Bike Board and Ski is northern Maine’s largest bike shop. The shop carries everything you need to get you on the road after the snow melts. From mountain to BMX to road bikes, Bike Board and Ski has bicycles for the whole family. Rose Bicycle is a locally-owned bike shop in the heart of Orono near the University of Maine campus. The bike shop stocks a range of Trek, Santa Cruz, and Transition bikes year-round. Combined with their expert knowledge and speedy tune ups, Rose Bicycle is one of the best bike shops in the Bangor Metro area. Perfectly situated at the gateway to Acadia National Park, Bar Harbor Bicycle Shop sells and rents bicycles to locals and visitors from around the world. From children’s bikes to high-performance road or mountain bikes perfect the trails nearby, you’ll find the perfect bike for you. If you’re looking to explore Acadia on two wheels then the Bar Harbor Bicycle Shop is the place to go. Since 1974, Kennebunkport Bicycle Company has been inspiring people to ride bicycles with their complete range of cycling products and services. The knowledgeable staff are experts when it comes to bicycle fitting, repair, and maintenance. They carry a wide range of bicycles from Felt to Raleigh to Quintana Roo. Bath Cycle & Ski has been selling bikes from the coast of Maine since 1976. 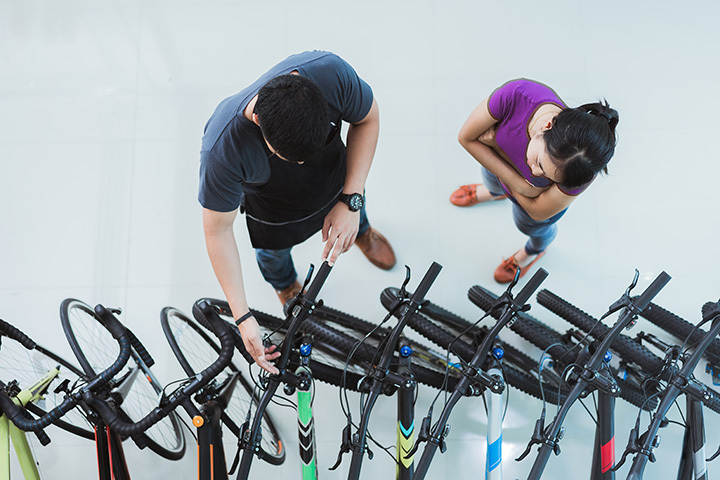 With knowledgeable staff, quick repair turnarounds and a great selection of new and used bicycles, there is a reason Bath Cycle & Ski is one of Midcoast’s top bike shops. CycleMania is Portland’s top road cycling shop. While they do sell mountain bikes, the shop is focused on selling high-performance bikes to future racers and triathletes. The shop sells Trek, Cannondale, Cervelo, and Seven Cycles. During the long winter months, the shop also hosts winter spin training classes to keep cyclists in shape all year-round. Don’t miss one of their weekly group rides during the warmer months.